About the Piece: “Firebreather” was created as a thank you to all of our wildland firefighters — past, present, and future. The piece was created to capture the beauty of our mid-summer lightning storms that blow through and create chaotic fires across the area. 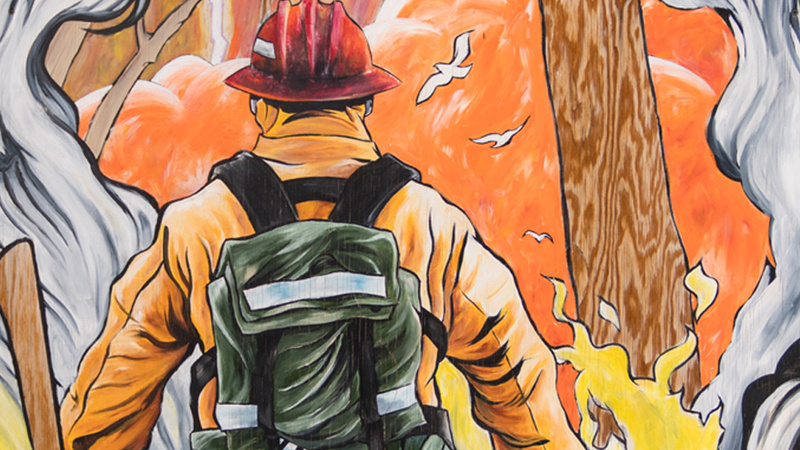 When this piece is auctioned, half of the profits to the artist will go to The Wildland Firefighter Foundation, a group that provides emotional and financial assistance to families of wildland firefighters seriously injured or killed in the line of duty. About the Artist: Avlis Leumas was in love with comic book art since grade school, drawing obsessively through his teens, only to give it up before graduating high school. After a 20 year sabbatical, he rediscovered his love for art in 2012, and now creates vibrant illustrations with markers. He grew up in California, moving to Bend after visiting for the first time with his wife in 2004. Visit him online at avlis-leumas.com.